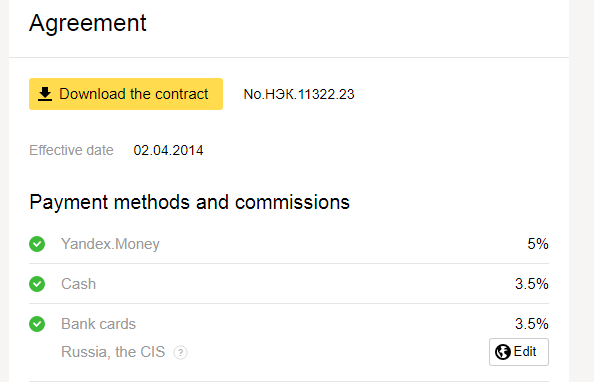 In the section Contract, you can look through the details of your contract with «Yandex.Money». If all your stores work under one contract, these details remain unchanged. If your stores work under different contracts, you can switch between stores. 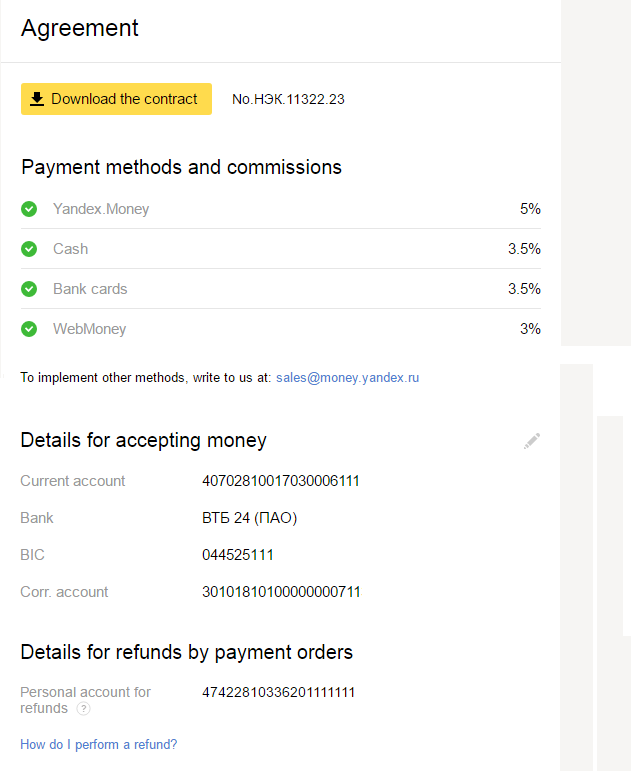 In this section, you can view the number of your contract with Yandex.Money. By pushing Download the contract, you get downloaded the contract you previously uploaded under your Merchant Profile when signing up. If you did not do that, you will not see this button. This contract may differ from the up-to-date one: if you need the last version, we recommend request it from your manager. In this section, you can look through all payment methods allowed for this store. And fees we apply to every successful payment. This list is set out in your contract. If you signed up several stores for Yandex.Checkout and want to view other fees applied, switch the store. We offer 4 bundles of countries which you can accept bank cards from. By default, you get a bundle including Russian and the CIS. You can see your current countries bundle below the Bank Cards payment method. 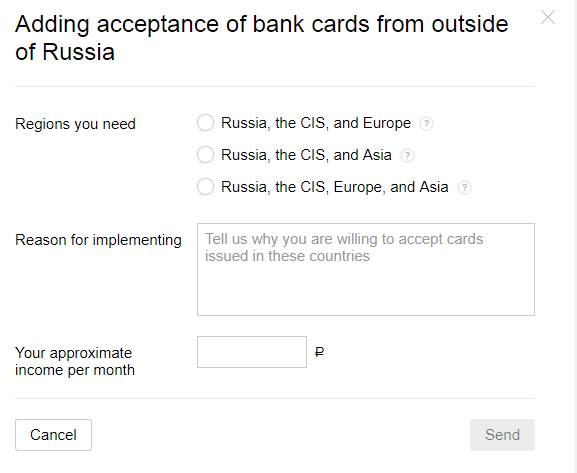 If you need to add countries, push Edit, select the bundle you need and explain why you need these countries (for instance, you received 100 payments from Bulgaria in a week). Our manager will contact you when the list of countries you can accept payment from will be updated. Details for receiving money is a bank account to which money is credited. When users pay for your products and services, first of all, money is credited to our service. And on the next business day, we credit it to your account. To do it, you can make a request for changing details for receiving money to on this page. Push a pencil icon to the right from the header. You will see a form for changing details. Change details: checking account and BIC. 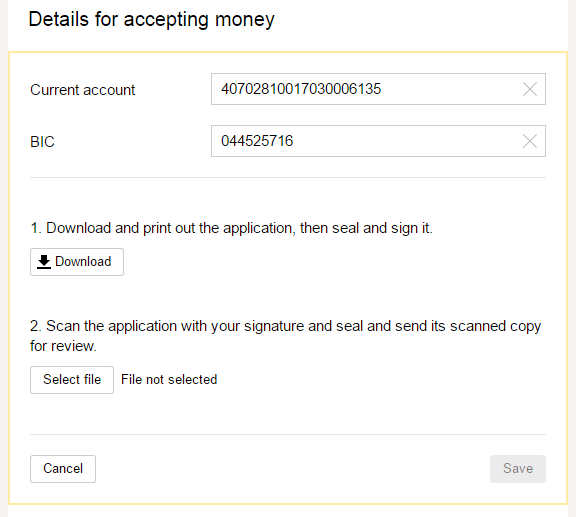 Download and print out an application for changing banking details, sign it, and place your company seal. Scan the signed application and upload it on this page. The details will not change instantly: our manager will get your application, check it, and change the details in our service. This is required for securing your money: if you occasionally specify incorrect account number, someone else will get the money. Push Add to open the form and fill it out. We will get the details, and you will again be able to adjust settings via your Merchant Profile.